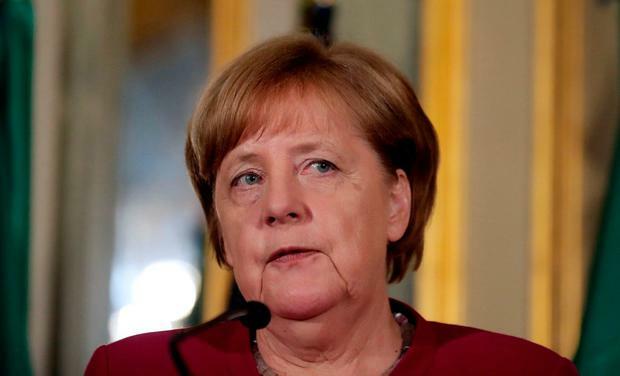 Angela Merkel has backed much deeper European integration in relation to the refugee crisis and defence, but rejected a "debt union" that would share the cost of financial crisis. In a wide-ranging newspaper interview yesterday, the German chancellor said the principle of solidarity among eurozone member states should not turn the single currency bloc into a debt-sharing union. It will be seen as a response to French President Emmanuel Macron's call last September for more solidarity in the eurozone. In her interview in the 'Frankfurter Allgemeine Sonntagszeitung', Ms Merkel backed turning the eurozone's ESM rescue fund into a European Monetary Fund (EMF) with cash to bail out member states, but only under strict conditions. "Such loans would be spread over 30 years and be conditioned on sweeping structural reforms," she said. The interview was published days after the formation of a new Italian government made up of the Five Star Movement and the League, both hostile to the euro and the package of post-crisis fiscal rules originally championed by Ms Merkel. "I will approach the new Italian government openly and work with it instead of speculating about its intentions," Ms Merkel said. Also yesterday, in an opinion article, the billionaire financier and activist George Soros said "Europe's flawed migration policies" were partly to blame for the rise of populist parties in Italy because they had imposed an unfair burden on the country. Italians also have "legitimate complaints as to the way the euro area is being managed", he said. Italy has been the first landfall for hundreds of thousands of migrants crossing the Mediterranean from North Africa. Since 2015, France and Austria have closed their borders to migrants seeking to leave Italy for northern Europe, Mr Soros said. Under Chancellor Merkel, Germany also accepted a huge number of asylum seekers in 2015 in particular, before an EU deal with Turkey to close the so-called Western Balkan route from Syria to Germany via Turkey and Greece. In her interview yesterday, she said Europe should set up a joint agency for refugees that would decide on applications for asylum at Europe's outer borders on the basis of common procedures, that would then likely see successful asylum seekers relocated across the union. It would mark the end of the so-called Dublin Regulation, under which asylum applications must be processed in the first country where a refugee arrives. The German chancellor said the EU border agency Frontex should be developed into a "true European border police" that can act autonomously. She also backed greater military co-operation, calling for the establishment of a European Security Council. That's a potential challenge to Ireland and other traditionally neutral member states including Austria, Finland and Sweden. Meanwhile, Mr Soros said the EU should pay Italy to support and integrate the migrants who are arriving there in disproportionate numbers, because relocating them isn't "possible nor desirable". Italy is now the EU's "most pressing problem" because it challenges the union's core values, he said. But he cautioned against Brussels trying to give Italy lessons that would drive more of the electorate toward the populists. The new Italian government may fall this year, or early in 2019, he wrote in an opinion piece for the 'Corriere della Sera' newspaper. Conte: leading Italy from a small crisis to utter disaster?